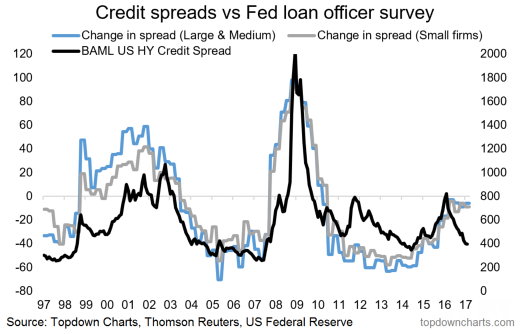 For those with a memory long enough to remember, it was about this time last year that almost everyone was talking about US high yield credit and the big blowout in credit spreads (which was largely caused by commodities). Since then the story has changed, as they say "if it's in the press it's in the price", in fact credit spreads have come in dramatically since then and are now trading around the bottom end of the range. The chart below shows this. Callum, to be clear - the blue and grey lines are the SLOOS data?